One of those things that can either make or break a hike or any other kind of walking activity. I recently learned the hard way, being in desperate need for a new pair. After hiking 75 miles of the Appalachian Trail over my Spring Break in March, I lost a significant amount of skin on the top of my big toes from excessive rubbing in the toe-box of my boot, and that’s never a good sign. So when I arrived at the building in which I would await my ride, I took off my Merrells with a sigh of relief. I knew with 100% certainty that I was not going to use them for hiking again. Don’t get me wrong, they were great boots! I bought them in the summer of 2010 and had since then worn them for countless weekend and longer hiking trips and they served me dutifully. Not even giving me any blisters once. But it was time to let them go. When the opportunity presented itself for me to get a pair, I chose the Ahnu Elkridge Mids; I was very excited. I’ve never hiked (with the exception of winter mountaineering) in anything heavier than a mid-height/weight boot, sometimes even sandals and trail runners if the trails don’t call for anything too heavy. So the Elkridge Mids were the perfect next boot for me. I received them on a Friday afternoon, and I was leaving for a 2 day, 23 mile hiking trip the following morning so it was the perfect chance to try them out. I know what you may be thinking, “Don’t you need to break them in before you take them hiking?” Although that is a fantastic habit to be in with any kind of footwear, I wanted to test out just how lightweight they were and the true comfort of the sole right out of the box. The testing grounds would be Shawnee State Park, also known as the “Little Smokys of Ohio” to some. It is known for its hills and would be the best place to test run the boots short of actually taking them to a real mountain. The first impressions were stupendous. Rising just above the ankle, the Elkridge is of similar height with other mid-height cut boots providing good ankle support if needed without making you feel like your hiking in your grandpa’s boots. There aren’t any of those pesky extra pegs to lace around before you tie your boot; the lacing system goes slightly higher removing any need of that. One of the other first things I noticed was the immediate comfort. With an EVA midsole and a neutral balancing system meant to keep your foot stable and not overcorrect its natural gait, it felt much more natural than most other footwear I’ve worn. This is a big factor for me when purchasing shoes because I have wider feet and try to wear minimalist footwear on a day to day basis, but sometimes you just need to compromise for the comfort and protection a boot can offer. Speaking of wide feet, the toe-box is awesome in these. My feet never once felt cramped and allowed ample room for the natural spreading your foot and toes perform when you step onto the ground. As far as performance is concerned, I was also very pleased on how they handled the endless ups and downs of the sizable “hills” that Shawnee had to offer. Since my boots were fitted properly, my feet did not encounter any sliding whatsoever inside the boot, so I kept all the skin on my toes!! One of the biggest selling points for me is the eVent waterproof fabric inside the boot itself. It is as waterproof as they come, and by gum, the breath-ability is amazing. It only plateaued in the high 60’s that weekend, but as a person with sweaty feet they are accustom to overheating in boots. Bottom line, these are great light weight hiking boots. Whether you’re going out for a walk in the park, need some work boots, lightweight boots for backpacking, or just to wear for everyday use, these are everything you are looking for. Interested? 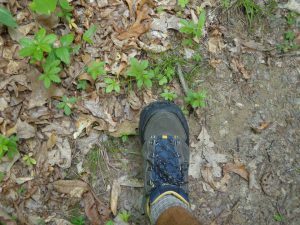 Feel free to come on in to Roads Rivers and Trails in Historic Milford to give them a try for yourself.sometimes requiring changing socks halfway through the day if I am hiking long miles. I actually wore the same pair of wool hiking socks both days I hiked; only changing into a fresh pair after we had arrived at camp. And by the end of the second day the inside of the boots were still as dry as a bone. 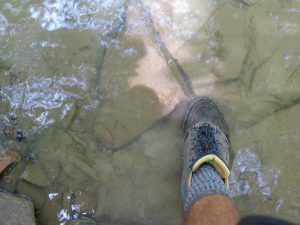 Just to say I tried, one of the last creeks we crossed with about 3 to 4 inches of running water, I walked right through it disregarding the stepping rocks to see if I could actually get these things wet. I was disappointed (more like really happy) to see that even literally being surrounded on every side of the boot almost all the way to the top, the boots kept me nice and dry.